Sharks swimming outside shark-proof cage with people inside. A shark-proof cage is a metal cage used by an underwater diver to observe dangerous types of sharks up close in relative safety. This can include various species of shark, but the most commonly observed within the confines of a cage are the great white shark and the bull shark, which are both known to be aggressive at times. Shark-proof cages are built to withstand being rammed and bitten by sharks, and are intended to protect the user from potential injury. Cages can provide a visual and tactile deterrent to sharks. Cage-diving allows people to closely monitor sharks for scientific, commercial or recreational purposes, and sometimes interact with them. The shark-proof cage is also used in the controversial exercise of shark baiting, where tourists are lowered in a cage while the tour guides bait the water to attract sharks or stimulate certain behavior. Shark cages were first developed by Jacques Cousteau. Cousteau used a shark cage during the production of The Silent World which was released in 1956. Rodney Fox developed his own shark cage in the 1960s. Fox's first design was inspired by a visit to a zoo he made after surviving a near-fatal shark attack in 1963. Later designs were refined further and put to use by documentary filmmakers and abalone fishers who sought personal protection from great white sharks. James Gimbel was one filmmaker involved in the design of a shark-proof cage which was used during the production of Blue water, white death (1971). On September 4, 1979, US patent number 4166462 was issued for a self-propelled shark-proof cage; being designed to allow abalone divers to collect abalone without becoming vulnerable to attack. Thanks to the propulsion system, abalone divers would exert themselves less and, therefore, be able to collect their prey for longer periods of time. The patent abstract details a self-propelled cage with at least one access opening and a mounting frame that carries both an air motor and a propeller. Buoyant material is attached to the frame so that the cage may be made neutrally buoyant. This patent expired on September 4, 1996. During the 2000s, shark cage diving become increasingly popular as a tourist activity. In South Australia, tourists are taken by boat from Port Lincoln to the Neptune Islands in southern Spencer Gulf where they view great white sharks either from a cage tethered to the back of a boat near the surface, or from a cage lowered to the seabed. The government considers the activity to be one of South Australia’s “iconic nature-based tourism experiences” which supports 70 jobs and contributes over $11 million to the state's economy. Shark baiting is a procedure where the water is baited by chumming with fish or other materials attractive to sharks. Tourists remain inside a shark-proof cage while tour guides bait the waters to attract sharks for the tourists to observe. There have been claims that this could lead to potentially aggressive behavior by the shark population. Some conservation groups, scuba divers, and underwater photographers consider the practice undesirable and potentially dangerous. 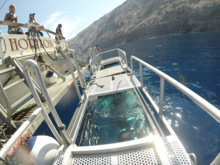 In South Australia, abalone divers have been attacked by great white sharks, and divers believe that great white shark cage diving tourism has altered shark behavior including making them more inclined to approach boats. At least one abalone diver, Peter Stephenson has called for a ban on shark-cage diving and described it as a "major workplace safety issue”. The government of South Australia claims that there is "no scientific evidence" to suggest that the general public is at elevated risk of shark attack as a result of shark cage tourism. Opponents of the cage-diving industry, such as shark-attack survivor Craig Bovim, who was reportedly bitten by a Great White shark (a species not targeted by cage diving operators in the region, and not generally considered a hazard to divers) while snorkeling for lobster at Scarborough, on the other side of the Cape Peninsula from Seal Island, where the shark cage boats operate, believe that the repeated chumming used to lure sharks to tourist cages may alter sharks' behaviour. [not in citation given] Bovim's opponents, such as marine environmentalist Wilfred Chivell, contend that there is no demonstrated correlation between shark-baiting and shark attacks against humans. However, there is evidence that the baiting of sharks for tourism does alter the patterns of movement of Great White Sharks. In 2005, a British tourist, Mark Currie, was exposed to a high risk of injury or death when a 5-metre (18 ft) great white shark bit through the bars of a shark cage being used during a recreational shark dive off the coast of South Africa. The shark circled the boat several times, and began to attack the side of the cage, then started to crush and bite through. The captain attempted to free the cage by trying to distract the shark. He did this by hitting it on the head with an iron pole. The shark bit into one of the buoys at the top of the cage, which caused the cage to begin sinking. Currie realized that he could either get eaten or drown because he had only a mask, not any breathing apparatus. Currie quickly swam out of the top of the cage and was pulled to safety by the boat's captain, who fended off the shark with blows to its head. In 2007, a commercial shark cage was destroyed off the coast of Guadalupe Island after a 4.6-metre (15 ft) great white shark became entangled and tore the cage apart in a frantic effort to free itself. Tourists captured video of the incident, which quickly spread throughout the Internet. ^ Townsend, Allie (2011-08-01). "Top 10 Unforgettable Shark Moments". Time. ISSN 0040-781X. Retrieved 2017-07-22. ^ "5 things you won't believe Jacques Cousteau put into the ocean". Trivia Happy. Retrieved 2017-07-22. ^ "The Shark Cage Was Invented By A Shark Attack Survivor". curiosity.com. Retrieved 2017-07-22. ^ "Special diving elevators used in "Blue water, white death" (1971)". Abilene Reporter-News. 1971-08-08. p. 36. Retrieved 2017-07-22. ^ a b Shepherd, Tory (2017-05-01). "Spencer Gulf abalone divers warn cage diving berley is putting sharks in a feeding frenzy and risking lives". The Advertiser. Retrieved 2017-07-22. ^ Zenato, Christina (18 May 2012). "Shark Diving, Shark Feeding, and Common Sense". Shark Savers. WildAid. Retrieved 26 March 2018. ^ Bruce, Barry (Nov 2015). "A review of cage diving impacts on white shark behaviour and recommendations for research and the industry's management in New Zealand" (PDF). CSIRO Marine & Atmospheric Research. Retrieved 14 October 2016. ^ "Bathing banned after Cape Town shark attack". The Irish Times. 31 December 2002. Retrieved 25 March 2018. ^ Bruce, B. D.; Bradford, R. W. (2013). "The effects of shark cage-diving operations on the behaviour and movements of white sharks, Carcharodon carcharias, at the Neptune Islands, South Australia". Mar Biol. 160 (4): 889–907. doi:10.1007/s00227-012-2142-z. ^ "He Almost Became Shark Food". CBS News. February 11, 2009. Retrieved 10 September 2012. ^ a b Jones, Sam (25 March 2005). "It was a real thrill, says tourist nearly eaten by 18ft great white shark". The Guardian. Retrieved 26 March 2018. ^ Gabe and Garrett (13 October 2016). "Great White Shark Cage Breach Accident" – via YouTube. ^ "Shark cage breach diver escaped out of a hole at the bottom, but faced two more sharks". Stuff. Retrieved 2018-05-11. This page was last edited on 6 January 2019, at 10:50 (UTC).